The Clameur de Haro and the legacy of feudalism | Notes from the U.K. This entry was posted in History, Traditions and tagged Channel Islands, clameur, Clameur de haro, Guernsey, legacy of feudalism by Ellen Hawley. Bookmark the permalink. Thank you for explaining the Channel Islands. I’ve never quite come to grips with them and I’m glad to have something else to blame on King John. John’s in no state to object, so be my guest. And his. Very interesting history lesson. Thank you. My pleasure. It’s a very strange corner of history, and the longer I write this blog the more of those I find. It’s more convoluted and incredibly difficult to follow than um… something else that looks like it’s being made up as we go along and no one knows what it all means. Yup. If I’d run into this mess just floating loose on a piece of paper, I’d have thought some science fiction writer was world-building. It’s too bizarre to be real. Also too bizarre to be made up. I wonder if Haro could extend his aid another 10.000-odd miles? I’d be willing to try un petit clameur against barking dogs. In case someone should ask about the pronunciation of the old language (now mostly morphed into Franglais) I was told when on Guernsey that words which use x and cq should sound somewhere between the Welsh “double el” and a dog about to vomit. I hope this helps. Oh, it helps immensely. Just stand in front of the aforesaid barking dogs and pronounce a few words correctly. They will be silenced in an instant. But only if you get the pronunciation right. I meant to say that if you get the pronunciation wrong on this, the dog barks for a year and a day. As far as I know, Guernsey,Jersey,, and Alderney are the only Channel Islands with cows named after them. Why didn’t I think to mention that? In fact, why didn’t I think to think it? One third of the explanation is that I never heard of Alderney cows. The other two thirds I’ll have to leave unexplained. I’ll write that down to make sure I don’t get rattled and ask for the dog’s breakfast. I hope there isn’t going to be a test. If so, maybe I can stop it by calling on my departed 1st-grade teacher. As I read this, I’m reminded of when I lived in Queens. People from the counties on Long Island would say we weren’t part of the island. Geography said otherwise, but it never won. I see your point. How could geography possibly win against a bunch of people from Long Island? There will be a test. And no, I’m not saying when. My niece was like that with one of the Jewish prayers she’d learned. (Long story–I doubt any family’s uniform in its approach to the world.) She recited the opening and said, “And after that you just mumble.” As far as I’m concerned, that’s the definitive version. Inestimably valuable information. Well, interesting at least. “Haro! Haro! Haro!” Sounds like a Village People song. Oh, I’d say valuable. You never know when you might need to call on the aid of a long-dead horseless ruler with an ill-defined title. I’m going to see if I can use it to get trump to resign. Do it. And do make sure you get some press coverage. I’m absolutely sure no one’s ever tried this approach before. I wonder if I need to go to Washington D.C. to try it, or if any old golf course would do? Being on the correct bit of real estate seems to be essential to making this work. Consult a lawyer or do some careful research, because the information contained in this blog cannot be relied on as legal advice, she said cautiously. Love it–you always post the most fascinating stuff! Thanks. It’s all about reading the fine print in the papers. I grew up in New York, so what I learned about cows as a kid–limited is too limited a word. I did know about Jerseys, partly from reading who knows what and partly because New Jersey was just across the river, so they sounded like something close to home. Ayreshire’s in Scotland (I had to look it up), so British. Too dead… you are too funny! I just love compliments. Thank you. You are most welcome, Ellen. 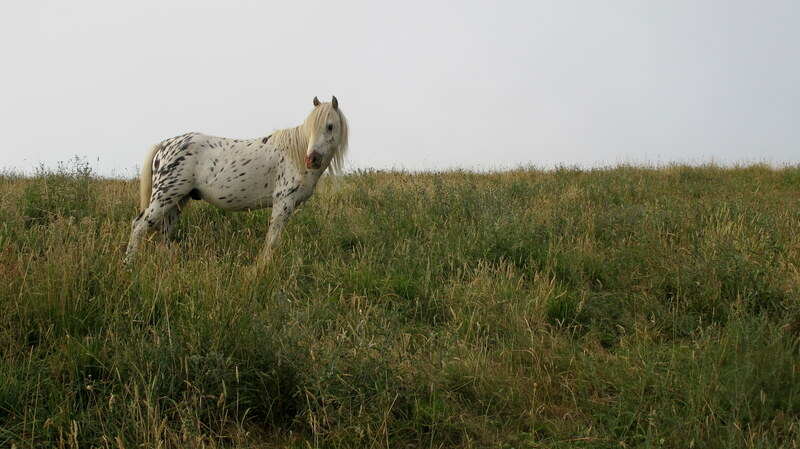 (1) The famous Appaloosa color gene on that pony…has it become established in Britain yet? (2) Guernsey, Jersey, and Sark also have knitwear named after them. (3) Seriously, does Scotland still use euros? Does England? (3) Sorry–I must’ve been unclear (no surprise in this context): Scotland uses pounds but prints its own, with its own designs. They’re interchangeable with English pounds but you don’t get happy looks when you spend them south of the border. And neither nation uses the other’s when they make change. Go figure. (2) I never heard of a Sark knit-thing. (1) I don’t know if it’s established or not. In fact, I didn’t recognize what it was on the pony, only knew that it was striking. I think my brain glazed over at the point where you said “If you’re not confused yet, you’re not following this.” Luckily I was confused so I opted out, fearing I might actually understand part of it. A wise choice, although I’m pretty sure it didn’t get any clearer after that. I think you missed the chance to use the word ‘balliwick’. Come on, when do you get that chance again? You’re right about it being a long time till I get another chance, although it’s been long enough since I wrote this that I don’t remember what chance I missed here. I usually write posts well in advance. It keeps my life marginally sane. It’s always nice learning new stuff. And you can never tell when this stuff in particular will be useful. 14th century: Haro was shouted at the dogs at the end of the hunt to attack whatever miserable prey had fallen to their (lack of) mercy. And great comment. Thank you. I still don’t understand what the donkey has to do with it, but I followed the rest of it. Not too sure either. Perhaps because poor donkeys got hit all the time? Not an easy life, being a donkey. Plus they get terrible press.